In the midst of our hectic, busy and fun/stress filled life, we halt for a second to ponder on a few things that we generally take for granted. If it wasn’t for the event which struck us directly or even indirectly,nothing much will significantly trigger us to retreat to our humble being and existence, as human, as servant of Allah, as servants of the Almighty. June and July 2007 are those two consecutive months in my life where i was brought to thinking (and deeply rethink) of the realm I’m living in right now, as well as the next. (you know what i mean..). The 3 names I’ve listed are 3 dear friends which will be dearly missed by their loved ones, friends and acquaintances. 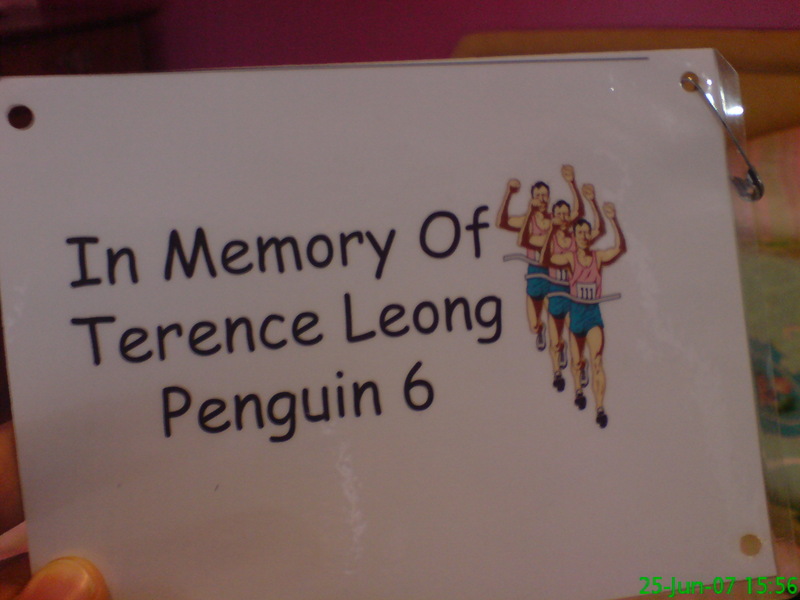 Terence Leong or Penguin 6 battled through brain tumour. 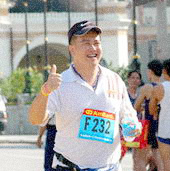 Despite the spirit, strength and determination, he finally lost to it on June 8, 2007. . The recent Nuri crash which claimed the life of 6 Malaysian heroes really touched me. I couldn’t even go through finishing reading the newspaper ! The fact that i recently completed my Wataniah recruitment, it did contributed to the awareness (in me) that people die serving their country, and it doesn’t have to be in the hands of enemies ! Allahyarham Captain Nor Azlan Termuzi , one of the crash victims was the brother to a high-school friend of mine (Nor Azzah Termuzi). You see, mishaps, calamities are the probables in life that do come uninvited..
Easy to comprehend this ?? I don’t think so.. The recent loss of Allahyarham Muhamed Zubir bin Zainal Abidin during the Port Dickson Triathlon caught everyone by surprise. I didn’t know anything about Allahyarham until Azwar told me about it. I went on looking for info on what happened on Sunday, asking Saiful and Jaja about it.. The news came in heavily .. I wasn’t there(PD) on Sunday as i went back after my event on Saturday. It was his first tri attempt.. They only realized at 12noon that something was amiss when they saw a bike still at the transition area. Body recovered kat tebing laut at 4.30pm… Thank you for the info Jaja.. the majlis sembahyang jenazah was held at his (Allahyarham) house at 9pm 22nd July, and after that terus dikebumikan at Tanah Perkuburan Bukit Kiara. To those yang nak ziarah , here’s the address : 44 Jln TR7/2 , Tropicana Golf Club. A few other fellow friends have written in tributes for Allahyarham Zubir (Zoob); OP Stupe, PM Tey and Bacin . From Tey and http://beyondcutoff.com . 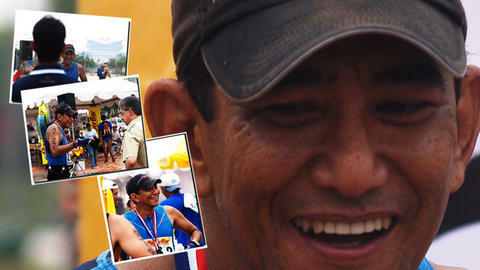 ” We are very proud of Zubir for starting his first triathlon race yesterday. It is unfortunate that we were unable to celebrate his first finish with him. Please join us/spread the word to all that you think would be interested to join our tribute. You are most welcome to copy and paste this entry on your personal blogs to help widen coverage. can’t agree more with the suggestion above ! so to those taking part in Desaru, take note ! To all of you, thank you for dropping by this humble humble page of mine. As you can see, i’m not dedicating it to only running or triathlon, but its also a place for destressing and revitalizing myself with life occurences, thoughts and ponders..
Al-fatihah untuk pakanjang zubir, semoga rohnya ditempatkan bersama2 orang yang soleh, amin. takziah buat makanjang julia, zul, ali n harris.. redha kan pemergian nya. Sesungguhnya allah lebih menyayanginya. Al-Fatihah. Dari Allah swt kita datang, kpdNya jua kita kembali.